This Awesome Desktop Arcade Machine Has Got Us Feeling All Nostalgic! The Cool Design Is Like Something You Would See Back In The Day In An Arcade Amusement Park! A captivating Blast from the Past! Tune into your inner nostalgia with this amazing Desktop Arcade Machine! A superb portable Mini Arcade with an amazing range of 240, 16-bit old-school games built in Retro Brilliance. Vast selection on games contained in this virtual desktop arcade including entertainment in genres like racing, sports, puzzles, shooters and fantasy. With a colourful 2.5" screen, built in speakers, 2 buttons and a functional 8-way control joystick it's just like the real thing! 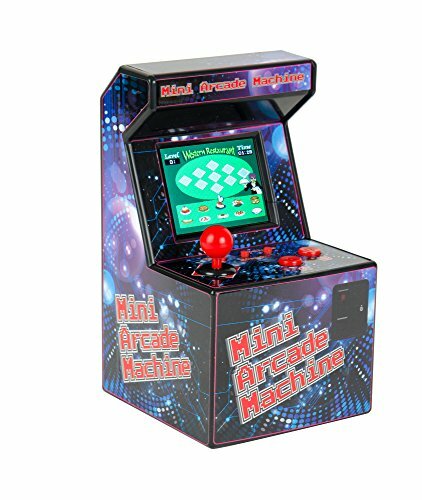 Arcade Machine is a miniature, fully functional replica of the real 20th century phenomena. Requires 3 x AA Batteries (not included).